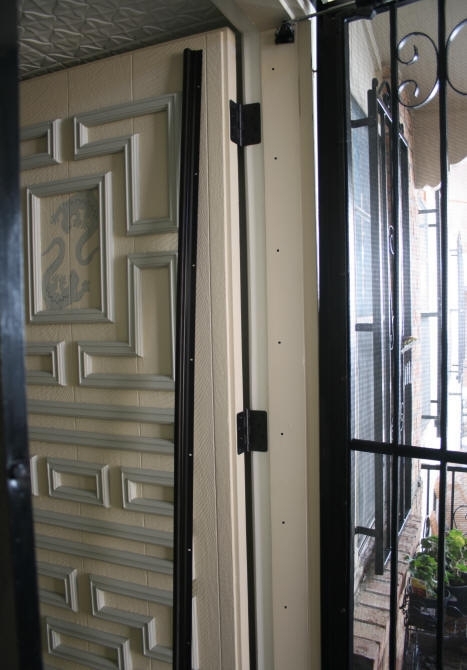 When I worked on my doors, as part of my ongoing door project, I had removed some of the old metal weather stripping that was around the frame of the doors. The old stripping was damaged in some areas, was ugly in some, and it was just easier to paint the frame without the stripping. As a result of removing the old weather stripping, there is air seeping in around the edges of some of my doors. With a swamp (evaporative) cooler in the summer, this was not a problem because you need to have windows open anyways for the cooler to work properly. During the winter, it becomes a problem with cold air blowing in. 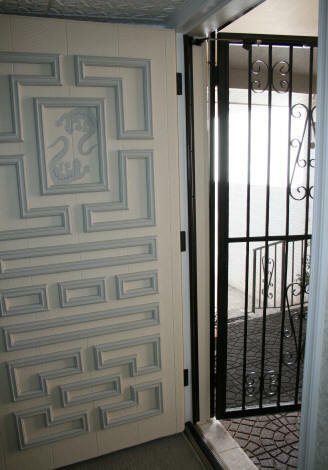 The door of this house, that has the biggest problem with air coming in, is the front door. I had removed ALL of the old stripping on this door frame. 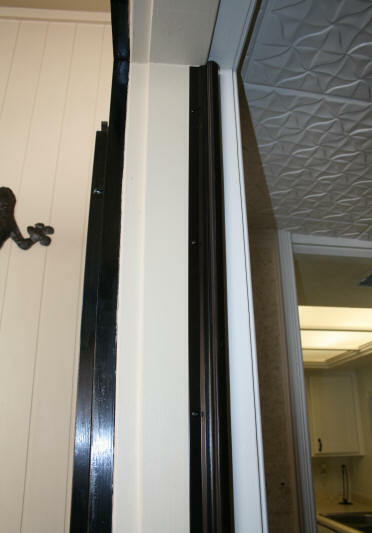 The door is slightly warped and had too much wood shaved off the upper door knob side of the door by the previous owners. The air is also seeping in at the top of the door. 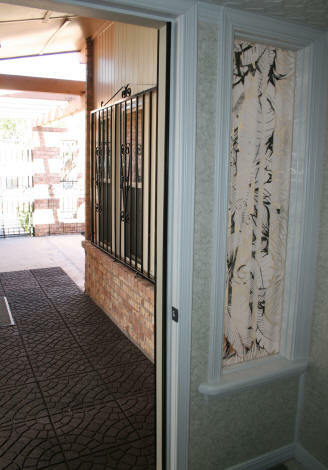 Photo on the left shows the area where cold air is seeping in at the front door. Note the big gap where the light is. 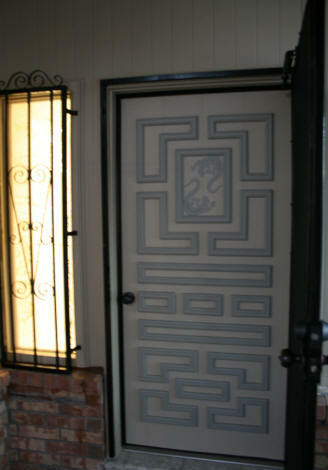 I had already installed a new threshold when I painted the door and worked on the entire front entrance. The seal at the bottom of the door was good. I did not want to put that ugly metal stripping on again. I also did not want the stick-on weather stripping. It only lasts a few years here in El Paso and looks tacky. So I looked at other options. The weather stripping that I found, that best fits my door and looked a little more classy than metal strips or stick-on stripping, was compression weather stripping. MD Compression Weatherstrip with Aluminum Stop The product I found on the internet was the MD Compression Weatherstrip with Aluminum Stop kit. 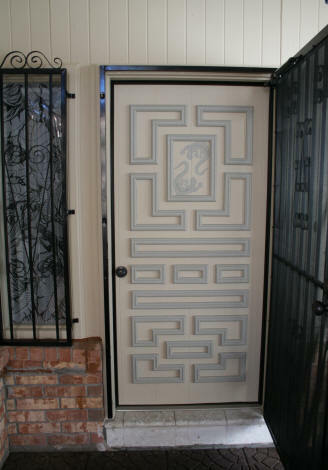 The kit comes with 1 - 36" piece for the top of the door, and 2 - 84" pieces for the sides. Screws are also included. I would have preferred a color that matched the paint, but they only have white or bronze. So I went with the bronze color that matches my door hardware. This product is available at hardware stores, online, or directly from the manufacturer, M-D Building Products in large quantities. The best price I found was online (Nov 3, 2013) from Global Industrial at $19.25 per kit + shipping. I ordered 4 kits, for my 4 doors. With shipping, it came out to $105.72. The item was shipped directly from the manufacturer in Oklahoma. UPDATE - April 2014 - Global Industries no longer carries this product. (Or perhaps they only carry it seasonally.) I could not find it on their website. I needed to buy two more kits for my backyard tool shed project. I ordered the two additional kits for $34.00 each on Amazon from a company called "Home Efficiency Products". The two kits arrived within 5 days. Packaging was done poorly. It was only wrapped in paper and the kits were bent a bit in the middle, from poor handling during shipping. They also used USPS which in El Paso, TX is problematic. I frequently receive items in awful condition with the post office here. Weather stripping should have been packaged in packing tubes because it is long and easily bent. The way this weather stripping works is simple. You mount it onto the door stop with screws. The vinyl piece that compresses when the door is closed, blocks the air. The screw hole in the aluminum allows for a little adjustment left or right before the final tightening of the screws. 1. Kit installs on door stop. Measure distance between threshold and top of door along door stop. Cut both strips to length. Cut with hacksaw or scissors. 2. With door closed place one long strip on door stop along hinge side. 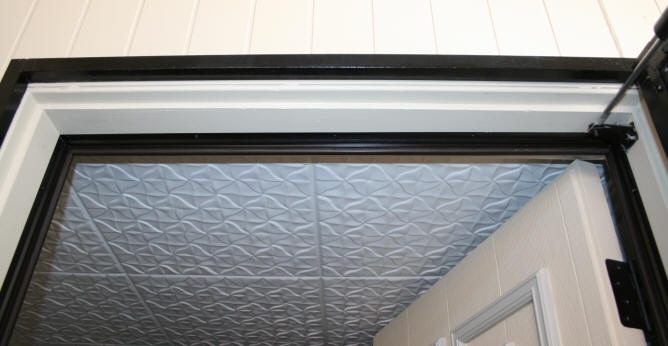 Install with fasteners so foam strip compresses lightly against the door. Install other long strip on latch side. 3. Cut short strip and install along top door stop so it fits snugly against strips mounted on sides to prevent leakage at corners. Install with fasteners included. These instruction are clear enough. Perhaps a little over simplified. I will follow the order of strip placement recommended by the manufacturer. I will add some tips below. STEP ONE -- Measure the two sides of the door frame. Measure on the door stop from the top of the door threshold to the top of the door frame. 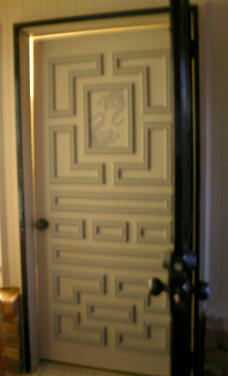 Tip 1 - Measure each side of the door separately. The measurements will probably be different. The hinge side of my door frame was 78 1/8" and the latch side of my door frame was 78 1/4"
STEP TWO -- transfer measurements to first piece of long weather stripping with pencil. 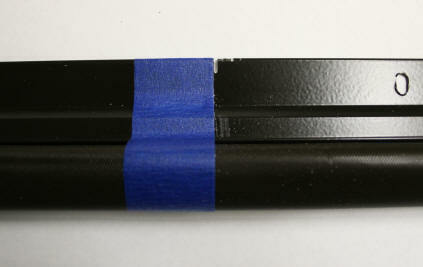 Tip 2 - Use a piece of painters tape to mark the edge of where the cut will be. Place the tape on the side that will NOT be thrown away. 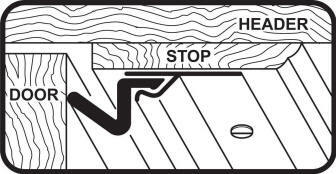 It will help protect the finish from your hacksaw and guide your cut. After placing the tape on, re-check your measurements again before cutting. Holes made in door stop for the weather stripping screws STEP THREE -- Cut the metal with your hacksaw. Tip 3 - When you get to the vinyl, cut it with your knife. The cut will be smoother. 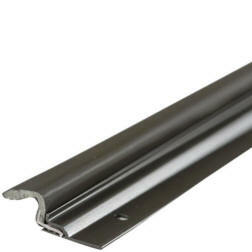 Use your metal file to smooth out the cut aluminum edge. STEP FOUR -- Place the weather strip against the door stop and close the door. Adjust the weather stripping against the door so the vinyl compresses. Mark with your pencil where each hole will be. Move the weather strip away from the door stop and open door. With an awl and hammer tap in your screw starter holes where you made your pencil marks. Place the weather strip back in place on the door stop and put screws in, leaving them loose. When done, close the door. Now make final adjustments to the weather strip placement and tighten all of the screws. Repeat STEPS ONE - FOUR for the other side of the door. In the photo on the right you can see where I angled the latch side of the weather stripping more to the inside along the top. This is to compensate for the door that is warped at the top and does not hit flush against the door stop. STEP FIVE -- Measure the top of the door stop between the two side pieces of weather stripping you just installed. For my door, the measurement was 35". 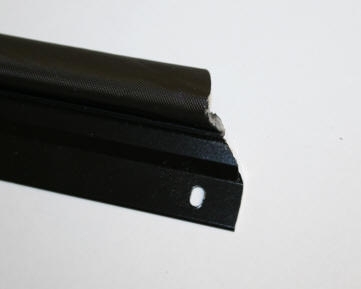 The short metal piece of weather stripping in the kit is 36". Therefore, I will need to remove 1". Now look closely at this piece of weather stripping in the picture below. If I cut the inch off of one side, I will be cutting off a screw hole on one end. Without a hole on the end, the weather stripping will not be firmly in place. So in this case, I will need to make two cuts to remove 1/2" on each end so I will have a screw hole on the very edge of both sides. STEP SIX -- Mark and cut equal amounts from each end of the short weather stripping piece. Tip 4 - You will need to miter the cut on both ends to get the piece to fit tightly in the corners. See photo at left. To do this, I made the straight cut first, and then cut a 45% angle on the raised aluminum part of the stripping. There was some fine tuning with the metal file to get the piece to fit exactly. Repeat STEP FOUR to attach the top piece of weather stripping to the door stop. STEP SEVEN -- Touch-up any parts of weather stripping or door stop where paint was nicked. Tip 5 - If you only have spray paint (I used an oil rubbed bronze color), spray the paint on the end of a Q-tip in an open outdoor area and then dab the paint on quickly before it dries. Except for the top piece, the weather stripping was relatively easy to install. Does it keep the cool air out of the house? Yes, it does! Does the door now pass the light test? See for yourself above. The only possible problem I can see with this weather stripping are the dogs, if they decide to take an interest in it and chew on it.